When it comes to exposing your skin to the sunlight, too much of a good thing can indeed be harmful. 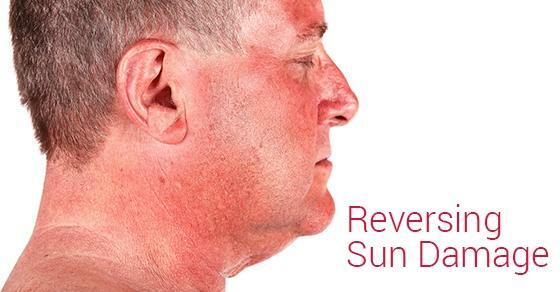 Over time, damage to the skin from the sun’s rays can lead to more serious issues. On the surface, sun damage can take the form of wrinkles and dark spots that slowly begin to appear. These can become permanent if they’re not addressed sooner than later. Although aging is unavoidable, there are some steps you can take to reverse the effects of long-term sun exposure. Hydration is one of the most important elements in reversing sun damage and restoring your skin’s health. Exposer to sunlight can cause the skin to become dehydrated. Use a quality moisturizer that is water-based to ensure consistent hydration. Be sure to look at the ingredients to know if a given product is water- or oil-based. A water-based product will absorb quickly into the skin and can help you avoid the fine lines and wrinkles that come from sun damage. A small amount of moisturizer is all you need to help reduce these lines and stimulate the growth of new collagen. A chemical peel removes the damaged external layer of skin, promoting the growth of healthy skin cells and giving the skin a new, freshened glow once healed. This is one of the most effective treatments for sun damaged skin and is often the most suggested by skin care specialists. Laser treatments are one of the most effective forms of reversing sun damage to your skin. Laser varieties such as IPL lasers, Broad Band Light, and other options like Fraxel, ProFractional and MicroLaser Peels are will provide a faster result than most other options and, unlike the extreme alternatives, there is very little downtime with laser treatments. Skin imperfections from brown or red spots, small red veins, wrinkles or crepe skin can all be reversed or drastically improved with lasers. Although not nearly as effective as a chemical peel, you can also use a Retinoid A cream to help restore the skin’s natural coloration. There are many products that are available over the counter for you to choose from. These can help restore volume, elastin, and the collagen of the skin. The retinol contained in such products is converted to the active ingredient retinoic acid, which is found in prescription skin creams. Be sure to use this for at least three months before expecting to see the visible results. The benefits of antioxidants are well understood in relation to general health, but they are also protective to the skin against sun damage. Products that contain Vitamin C, green tea, or copper will provide effective protection against sun damage. They are anti-inflammatory, which helps to reduce irritation and redness while also encouraging skin healing. How well you care for your skin on a daily basis will be key to reversing sun damage. Your skin builds up dead cells that can make it look uneven. Removing these dead cells regularly will revitalize the look and health of your skin. Use a mild scrub to exfoliate your skin each week. This will improve the turnover of cells, helping you reverse the effects of sun damage. Use warm water to rinse after exfoliating. Sun damage can lead to unsightly skin issues like pigmentation and wrinkles. It can also increase the risk of developing more serious skin problems. Using these tips will help you protect yourself from future damage and restore the natural vitality of your skin.